The latest advancements in therapy, medication and self-treatment provide depression sufferers with an array of newfound hope! If you or someone you care about are one of the nearly 10 million Americans who suffer from untreated depression, this book is a first step to alleviating the pain and misery depression can bring. The newest approaches to treating depression mean you are just a proper diagnosis and the right treatment plan away from rediscovering the lifestyle you want to lead. 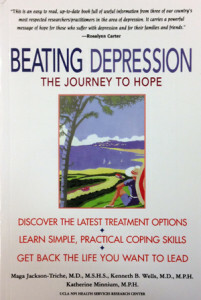 In Beating Depression, nationally recognized practitioners/researchers at UCLA, Maga Jackson-Triche, Kenneth B. Wells and Katherine Minnium, equip you with the knowledge and tools to get the upper hand on those feelings of hopelessness. Beating Depression provides expert advice and guidance on how to find a mental health professional, what pharmacology and therapy approaches are available, and a host of skills that you can use each day to conquer depression. You’ll also find self-assessment tools to help you gauge your depression, as well as many inspiring true stories from people of all walks who have tackled their own depression problems. Beating Depression assures you that you’re not alone in your battle and arms you with the insight into everything you’ll need in the quest to regain the happiness and joy in your life.